I have been fortunate enough to undertake a number of seasons in the past couple of years, both summer and winter. Summer seasons can be a very fun experience and a crazy adventure to have during University summer holidays or gap years. Winter seasons are equally great but obviously cannot be undertaken whilst at University due to the season being December to April but can be done in gap years or in-between jobs. Summer and winter seasons can be paired together well, with many summer seasons finishing in November and winter seasons starting in December and likewise in April when winter ends and summer begins. The Job: As a seasonnaire often you work for a company. 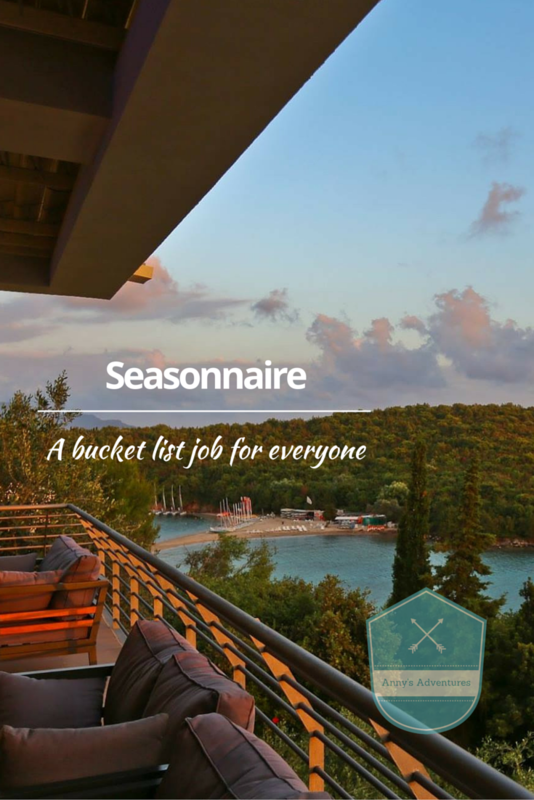 You can undertake a variety of jobs from water ski instructor, nanny, chef, hotel host, tennis coach, lifeguard-you name it, it’s a seasonnaire job. The job is unlike any other, you may end up doing a job which you could do at home, for example being a waitress or cleaner, but imagine sunbathing on the beach or skiing down a mountain during your split shift. Be warned the hours are often long, but the job is very rewarding. You will look at every job differently when you return home, trust me. To Travel: Seasonnaire jobs are mostly available abroad- many winter season jobs are located in the French Alps, Italian Alps, Austria, Switzerland, Andorra or even in America or Canada. Imagine waking up every morning to a mountain view out of your window. Summer season jobs are located mainly in Greece, Turkey, Italy or France. Although this is true, you can occasionally get a job which is a little further afield for example in the BVI, Caribbean or the Maldives. I can’t think of anything better than spending 6 months in an all inclusive beach resort. The People: Many seasonnaires who work for English companies are from England, meaning you could find yourself in the middle of Greece or Turkey surrounded by English speaking people. There have been a number of times when I have been on a season with people who live in the village close to me or a city less than a hour away. Seasonnaires are a specific type of person- adventurous enough to leave their home for a period of time and work abroad. I have met some amazing people on seasons, who I found I had more in common with than my friends at home or school (this is especially true for the people in your department who share many of the same interests as you). You will often find that people don’t usually do just one season, so you may end up doing a number of seasons with the same people. The Lifestyle: Who doesn’t want to spend 6 months in 30c weather at the beach or snow skiing or boarding everyday for 5 months. Drinking everyday becomes the norm (especially apres), you live with your friends, get paid to do something which you love and meet some amazing people (colleagues and guests). Just to warn you, it’s super easy to get stuck in the seasonnaire life but life is about having fun and seasons definitely are a lot of fun. The Opportunities: Working on a season creates many different opportunities. I have been on seasons where guests have interacted well with employees and have offered them jobs. Seasons are also a great way to move up in your careers (especially management roles) in a short space of time. You can become a department manager in a year if you perform well and there are also opportunities to become hotel management. Overall Experience: A season will be one of the best times of your life. You won’t want to leave. The people you meet will stay with you for years to come, you will forget you are being paid and go on an incredible journey of self-discovery. Seasons also look very good to future employers. All these opinions are my own, but if you have the slightest desire to go on a season, do it- you definitely won’t regret it. There is no better way to travel and work in another country whilst making memories that last a lifetime! Great post! I loved my time working in Italy. I did three seasons and this post brings back some great memories for me. I may even write a post on my time as a seasonal worker myself. Thanks for sharing.